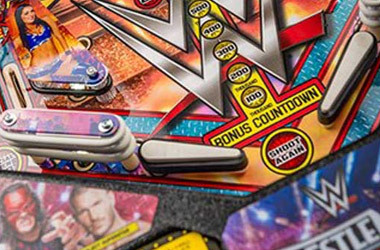 Pinball tables are colourful, crazy and chaotic to look at – it takes time to work out where all the switches and flippers are, even for veterans. However, the basic components are always the same. Whether you’ve played all your life, or you’re looking to upgrade from the PC game to a real table, there’s always a new secret in the table in front of you – so we’ve put together a guide that will make sure you always know how to spot the essentials. Pinball is played on a slightly tilted table, usually raised at the far end from three to seven degrees. This creates an incline for the ball to roll down – some table owners might even make this harder by raising the back legs slightly and steepening the drop. The playfield is covered with a pane of glass, to stop interfering hands from righting mistakes! Above the playfield you’ll see the backglass – probably what drew you to the machine in the first place. This panel usually sports artwork and promotional graphics for the game (and the related franchise), and sometimes certain in-game moves can trigger small mechanical eye-catchers. The most important part to the player is the scoring screen – LED lights, usually, in bright colours, keeping you updated with the score, and different objectives and achievements throughout the game. Learn to keep an eye on this as well as the playfield, and you’ll find your way around the table far more quickly! The plunger is a spring-loaded toggle that starts the game – pull it towards you, and let go to spring the ball into the playfield. Some machines have replaced this with an electronic button, but plungers are always the favourite – you can control the amount of force to try and pull off different skill shots, but for casual players, as hard and fast as you can fire it is the best way to go! The most iconic part of the Pinball machine, the flippers are usually the only part of the table that the player can control. They actually weren’t part of the early Pinball machines; they came into fashion around the 1940s as a way to perform cooler trick shots and exert more control over the ball to keep it on the table for longer. The classic layout is two at the bottom of the table, although as machines are getting more complex we’re seeing levers pop up across the playfield. Stationary: The most simple. These stay where they are and simply score when you hit them. Kicking: A rarer form of the stationary target, with a popping mechanism to push the ball away when hit. Vari-target: Again these are similar to stationaries, but their scoring depends on how hard the target was hit, so you’ll want to really employ those flippers and bumpers to get a good hit. They often look like the targets in fairgrounds, which swing back when you hit them – and you can get mega points for knocking it all the way back. Bullseye: Similar to the stationary targets, but with a dartboard-style design of two circles – so you’ll get more points for hitting the centre than you will the outer circle. These are pretty old-school now, but they’re a firm favourite among regular players. Drop: These targets disappear when hit, dropping below the playfield. Usually the aim is to eliminate all drop targets for mega points, but you may also need to hit them in a certain order, or only take out one line at a time. One variation is for drop targets to sit in front of stationary targets, meaning players need to eliminate the drop target before scoring the stationary target. The bumpers are round knobs found across the table. New bumpers, often called “pop bumpers”, add a sense of speed and unpredictability to a Pinball table; when hit, they actively push the ball away using a switch that activates the solenoids, “popping” the ball away and into other bumpers or further afield. These are a pretty new feature in Pinball, and behave in a similar way to the pop bumpers. The rubber pads stretch across the top corners and sometimes sides of the playfield, springing the ball away using the same switch mechanism but at a lower voltage, to give the movement that rubbery bounce. 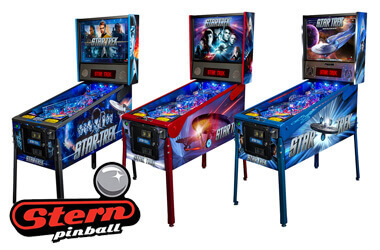 Those are the major components of most modern Pinball tables – but there are still more unique features that make each table different. Next, we’ll look at some of the more unusual and complex aspects of the Pinball table. Holes have always long been a part of Pinball tables, from the tube-and-pin mechanism of the older machines to the electronic system used today. Holes: Normal holes are simply that; usually a target-sized hole in the floor of the playfield. The function tends to change depending on the game: in some tables losing the ball down the hole is akin to losing it in the bottom drain, while others offer large rewards and bonus points, at the expense of the ball. Many tables also have “scoops”, which lie horizontal to the table and fire the ball back out in the same direction. Saucers: These are shallower than holes, and usually contain a kicker inside to ping the ball around before re-releasing it into the playfield. These stop the ball in its tracks, and can be incredibly useful when trying to rack up a few extra points. Switch: Usually these will block off an area once the ball has passed through – for example, the chute down towards the flippers, or the firing lane itself, which cannot be re-entered. Gates work in a similar way; these essentially only allow the ball to pass through in one direction. Stoppers: The Pinball-lover’s best friend! The stopper is usually found between the bottom set of flippers, preventing the ball from falling into the drain and out of the playfield. It needs to be activated within the playfield, and usually will only stay until hit once, or until its time expires – but it can be a life-saver! Spinners and rollover only require the ball’s contact to activate – but both work in very different ways. Rollovers: These are targets which light up and score points when rolled over. More complex systems set up lanes or groups of rollovers that need to be hit before points are scored or a new objective is activated. Spinners: Spinners are hinged, spinning components like a wind turbine, which score a point on each rotation – making it worthwhile if you can hit them hard. A variation on this is the whirlwind spinner, which rotates throughout the game and can grab the ball to send it flying in a new direction. This should give you a good starting point – but don’t forget to experiment with toys, ramps, capture zones and all of the other features available on your local table. The best part of Pinball is that every table is different – so get out there and explore your Pinball playfield! The Original Medieval Madness pinball - reconditioned!